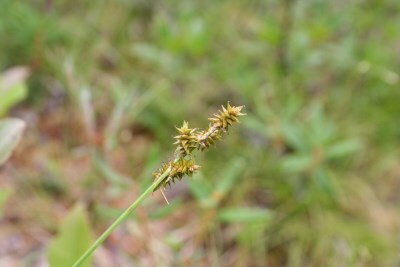 Rare along edges of bogs, along trails, and in open swamps, in acidic, peaty or sandy soils. A distinctive, stout, broad leaved (in contrast to its close relatives!) plant with a compact inflorescence. 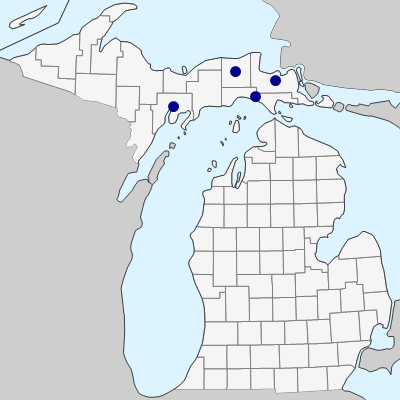 First collected in Michigan by E. G. Voss in 1984 in Luce Co. The sheath apices are relatively strongly thickened and less translucent, often more yellowish, than the rest of the sheath; usually much more so than any of its more narrow-leaved relatives. MICHIGAN FLORA ONLINE. A. A. Reznicek, E. G. Voss, & B. S. Walters. February 2011. University of Michigan. Web. April 21, 2019. https://michiganflora.net/species.aspx?id=1082.